The “Black & Beautiful” discussion included how hairstyle, skin tone and body image have an impact on black women’s lives. The discussion event “I Am Not My Hair” gave black women a chance to share experiences and beliefs on how their hairstyle, skin tone, body image and more impact their lives and black culture. “Our purpose in this discussion was creating a space, particularly for black women on this campus, where they could feel safe, they could feel welcome and discusses concerns that are relevant to their experiences as black women,” said Destiny Randall, a third-year doctoral student in the Counseling Psychology program. 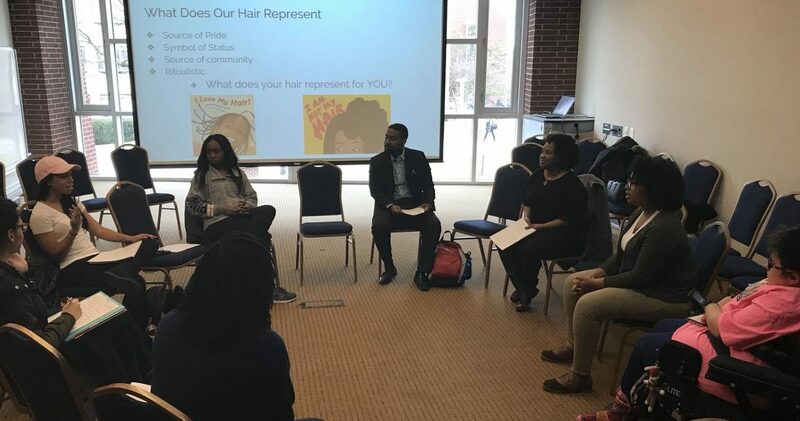 Randall and Brittany Griffin, also a doctoral student in the Counseling Psychology program, started the discussion by asking the group if they believe hairstyles act as a “source of pride, symbol of status, source of community” and can they be ritualistic for the black community. One student said she feels hair is a source of pride, especially when black women wear their hair natural because it shows they are proud of the texture and look of their hair. Discussing the importance of hairstyle to women, one student said the two things he finds important is that the hair appears to be well kept and women feel comfortable with that hairstyle. Randall said black women are able to wear their hair in several different styles and should remember that they are beautiful in every style they choose. Instead of debating the different styles, black women should be celebrating them. Later in the workshop, Randall and Griffin discussed the different effects of body image on black women. After showing pictures of famous black women, Randall and Griffin asked the group if they felt the women accurately represented the black community. One student said she didn’t feel the women fully represent the black community because their hair is straight and hers is natural. Swinton said she felt each woman embodies a different part of the black community. However, Swinton believes they also represent the stereotypical image of black women as portrayed in the media. One of the last themes the group discussed was the idea of colorism, which is “a prejudice or discrimination against individuals with a dark skin tone, typically from people of the same ethnic or racial group,” Randall said. In response to Swint’s comment, one student said he did not agree with the idea of saying “we are all still black people” because he feels it undermines and ignores the struggles dark skin people face. Another student said colorism is problematic for young girls with dark skin growing up because they face many forms of prejudice and discrimination from others in the black community instead of being taught to be proud of their skin. Overall, Randall said this discussion and others of the same nature are safe places where women of color are welcome to share their struggles and life experiences. For students who could not attend the event, Griffin wants them to understand that the struggles black woman face are shared and that there are black women in the world who can help affirm or support those struggling. More people should “come to this event, even if they’re not black so that we can all get a better understanding of each other. It’s just nice to learn about each other,” Swinton said. Griffin said the next event sponsored by the Counseling and Testing Center is the “Mozaic: Women of Color” workshop. This workshop will cover similar topics as discussed during “I Am Not My Hair”, but all women of color are able to attend this workshop. The “Mozaic: Women of Color” workshop is Wednesday, March 14, 2018, at 1 p.m. in Room 310 of the Student Union.